Aquafaba is now officially on the blog! I’ve been getting lots of questions about whether I use aquafaba in baking, if I have any recipes, and so on. Part of those questions stemmed from all kinds of aquafaba-y things I used to share on Instagram — my many experiments and casual baking adventures. 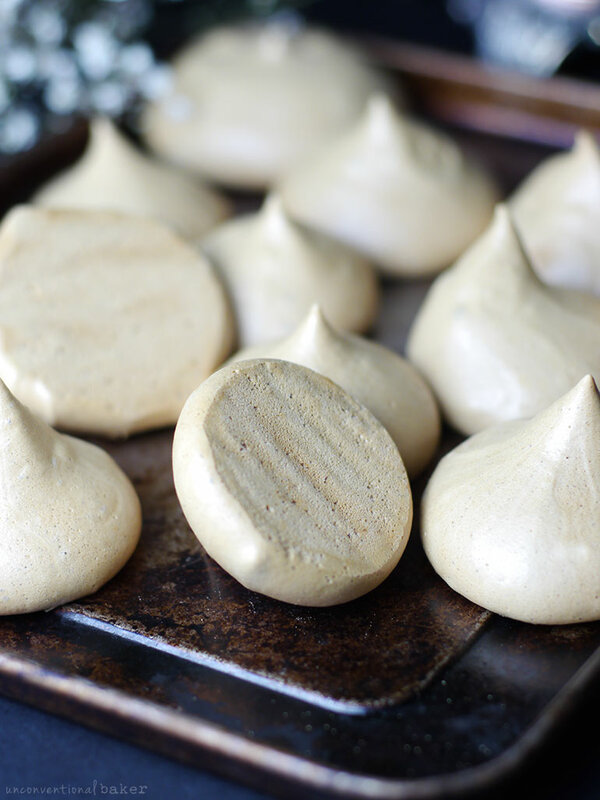 So finally, here’s something yummy featuring that magical bean juice — super simple aquafaba meringue cookies. I’ve personally used it in meringue things of all kinds, in whips (it makes delicious whipped cream! ), and chocolate mousse. I don’t use it as an egg substitute in baking, because for the most part my brain just completely re-adjusted to baking without eggs and therefore I don’t usually look for “substitutes”. 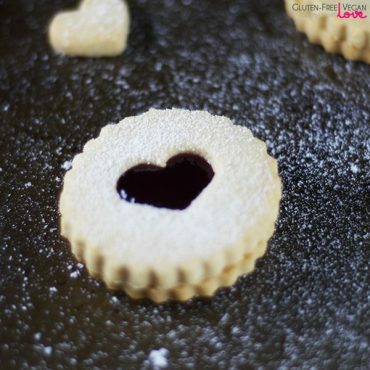 However many of my blogging pals have been making awesome cakes, cookies, macarons and more.. So this salvaged bean “juice” definitely has potential. It really works best in combination with white sugar. Maple syrup or any of the lovely liquid sweeteners I usually use don’t work for baked aquafaba goodies. You can make good maple-sweetened whipped cream with it (follow the recipe steps, skip the coconut sugar and just fold in a few tbsp maple syrup instead and don’t bake). You can make very good chocolate mousse with it with maple syrup as well. But if you want crispy crunchy meringues, white sugar or something like xylitol (aka my nemesis) are usually the way to go. For this recipe I made it work with coconut sugar (yay!). All the blogging pals and recipe developers I talked to said it doesn’t really work. But I gave it a go anyways, and found it does. You just have to make sure your coconut sugar is of a fine grind (so use coconut palm sugar, which is naturally finer, or regular coconut sugar ground down to a finer consistency in a coffee grinder / magic bullet). That said, the stability of this recipe is a bit volatile, so adding more things to the mix might affect how your meringues turn out. I tried this out with flavors, for instance, and sometimes it worked just fine, other times I felt the texture / consistency was better without. 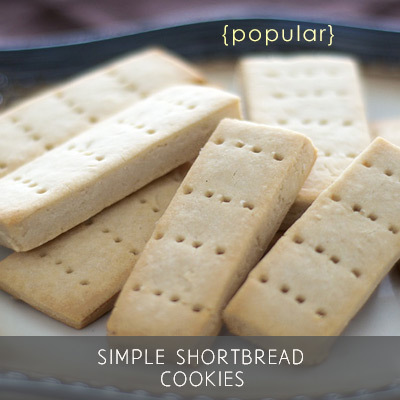 I usually make mine plain and they’re yummy au naturel. Also, on the note of stability, keep your meringues small. 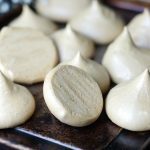 I tested this recipe many times throughout the year and found that any larger than the meringues pictured, and you won’t get those little “kisses” peak-shaped cookies. Also, if you make them too large, the center might not bake through all the way. They’ll still be delicious, but a bit chewy inside. If you’re cool with that, go ahead and make them as giant as you like. This is the second kicker. It takes a while to get the meringue to stiffen up to the right consistency. You sort of, kind of need a Kitchenaid to get it going right (unless you’re cool with an intense shoulder/arm workout, that is). I didn’t own a kitchenaid mixer when the aquafaba trend first kicked in. My kitchen was already filled with equipment of all kind and I preferred to invest in a good processor and blender instead (see this page for what I use, if you’re curious) since I use those all the time. But my mother-in-law gifted me hers last year (yay!!) and of course meringue was the first thing I began making with it. Definitely makes things easier. I also found that in the past when I made aquafaba things with my hand blender that it just never quite came out right. Having started using the standup mixer, I can totally see a difference. It’ll still work with an electric hand held mixer, but a free-standing mixer makes life easier with recipes like this. Kind of brings up memories of my grandmother whipping up meringue by hand actually — she must have had arms of steel! There’s one other thing on this note (who’s with me on this): you have to listen to a mixer going for 15 mins… Oh well, at least you get rewarded with lots and lots of cookies in the end :) Sweet consolation! It takes a looooooong time to bake. Perfect right now when the weather is cold (I live by the stove). But when you don’t want that big “heater” running, it’s a pickle. That said, at least you don’t have to do anything — just pop them in and pull them out when it’s time. One last thing I wanted to share is that meringue (even traditional) is very oven / temp sensitive and can be temperamental. It might take you a few trial batches before you nail it so it’s perfectly done on the inside (try adjusting the oven temperature up or down, spooning smaller cookies, baking longer if need be, etc., if it doesn’t come out quite right on your first try). From there it’s a breeze — promise. You’ll be able to make them in your sleep! And your not-so-perfect trial cookies will make a great addition to an eton mess, or just as a breakfast bowl / nice-cream topper… So fear not, your cookies will not go to waste. Other than that though.. get ready for some yummy meringue crunching ? P.S. They need to be kept at a cooler temperature or room temp and either eaten same day or stored in a sealed container. After a few days they’ll begin to soften up, so should ideally be consumed within the first 2 days. If it’s very hot where you are, there’s a chance they’ll begin softening sooner, so store them in a cool place. 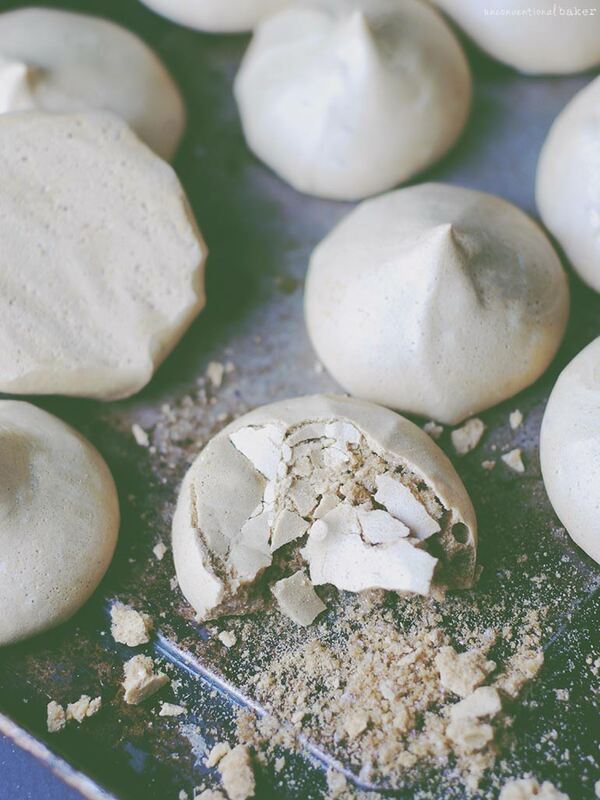 Tiny eggless, refined sugar-free meringue cookies made with aquafaba…aka “chickpea juice”. 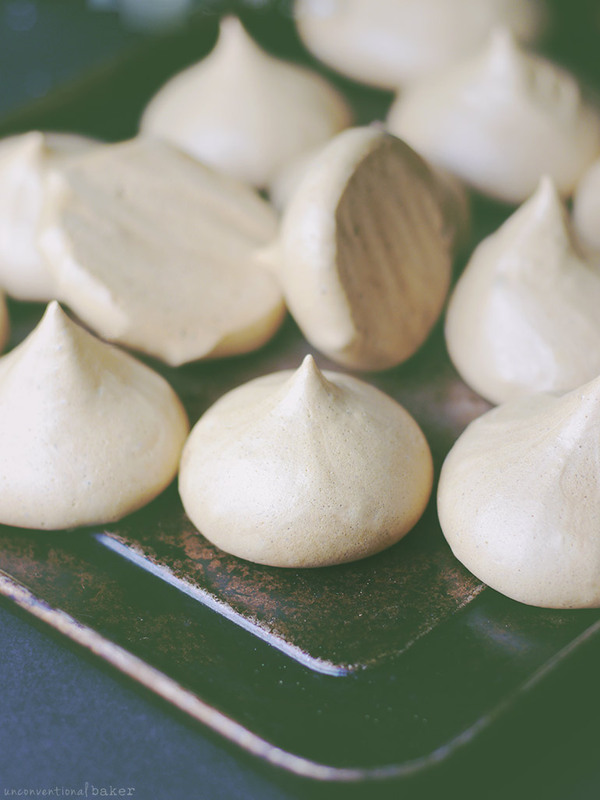 Classic vegan meringue recipe, 3 ingredients, super simple! Bake in a pre-heated oven for 2 ½ hours. Remove from oven, cool on a rack (they’ll firm up a bit more as they cool) and enjoy. Would white ground stevia work as well as white sugar? I jusr made these without guar gum or cream of tartar: use double the quantity of xanthanum powder and it seems to work just fine. Also worked for hand whisking – 15 mins, same as using a mixer (did switch in my partner 10 mins in to save my arms). Very cute and baking in the oven now! I used regular powdered sugar (didn’t have other options on hand) but half the quantity, and 1/2 TSP peppermint extract and 2 drops green food colouring for mint meringues. Thanks so much for sharing, Madeline! I’m so glad the recipe worked out and really interesting to hear your substitutions. Love the green peppermint spin on them! Wondering if you think ground chia seeds might work instead of guar gum because I like to stay away from that binder? Hi Jennifer, I haven’t tried because I think the ground chia seeds will weigh the mixture down too much and you want to keep it as light and airy as possible. “You can try cream of tartar instead. I find it works slightly better with guar gum, but cream of tartar is the next best alternative. I am am over moon with how these turned out. Mine took on a maple color & flavor. I used Madhava blonde coconut sugar. 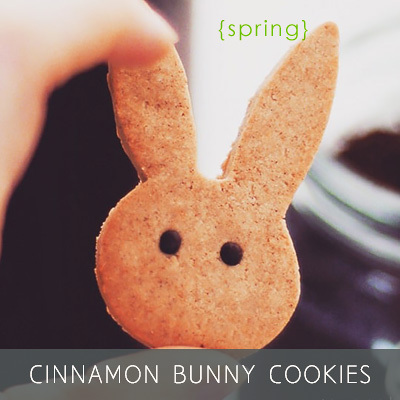 They are crispy & sweet & perfect. Thank you so much for this recipe!!! I have a pic, email me if you’d like to see it. And thank you for offering to share your photo. I can’t tell how old your comment is, but I think the issue is that convection ovens are intended to cook things faster doe to additional air circulation, so maybe 200 degrees in there is “higher” than in a conventional oven, if that makes sense. What is the purpose of guar gum in this recipe? Can we make whipped cream without it? Hi Marta. The guar gum acts as a stabilizer for the aquafaba foam. You can definitely make whipped cream without it, but it works best with a tiny bit of cream of tartar (like an 1/8 of a tsp) for a thicker whip. Hi Audrey – these actually worked out well despite not measuring out the maple sugar! I was wondering can i leave them in for a little less time if i like them a bit chewy (like macaron biscuit texture) or is that not possible? Thankyou! Just popped these in the oven! I really hope they worked… Im not sure if it was stiff peaks (Ive never made anything that required me to know!) and i stopped a few times for a minute or so in between mixing. I also didnt measure out my quantities of maple sugar… just tasted to see when it was sweet enough! I just read in your comments that they do actually need heaps of sugar ahah. Whoops… will update soon about whether or not they have worked! Does your book contain “AQUA FABA” recipes? Oh my goodness! These turned out so well on my first try! I added a couple drops of almond extract because it was smelling very chick-pea’y in the mixer. It all came together marvellously! I think I’m going to try to make a pavlova out of this recipe next week for a dinner party. It’s such a great recipe to show off with! Thank you SO much! Thank you so much for the beautiful feedback. I’m so happy they worked out so well :) Made my day! P.S. If you figure out a pavlova, do share! I’ve been able to make a large meringue cake with this that resembled a pavlova but alas wasn’t quite perfect on the inside. thanks for all the information and they look perfect, just one thing, how can you make any baked goods with aquafaba does’t taste like chickpeas? I’ve tried pumpkin cake , it was unbelievably fluffy but tastes like chickpeas! what to do? Hi Farida. To be honest, I’ve not baked much with aquafaba (besides meringue). I did try a few baked goods last year and didn’t find that they tasted like chickpeas at all. I do know that sometimes if the liquid is “muddy”, it can have chickpea / bean residue in it, which might add to the taste. Also if the aquafaba is not fresh (like if it’s been sitting in the fridge for some time), the flavor can get stronger. But I think it’s all about balancing the flavors right. So if you’re concerned about the taste but the texture is good, I’d play up the vanilla and cinnamon (or pumpkin spice) flavors, for instance, etc. It won’t let me give it 5 stars. I am in awe. I had no idea that the chickpea sludge I usually pour down the drain could make such delicious meringues! It whipped up beautifully – snowy white. I was concerned because as I was piping out the batter, it was a little stickier (like loose taffy) than egg whites, and after they baked for 2 1/2 hours, they were still pretty squashy. I left them in the oven overnight (with the door propped open with a wooden spoon) and this morning they are PERFECT. My vegan friend will finally get to taste a meringue! I think I’ll be using aquafaba more often. I used coconut palm sugar, and the meringues are now a caramelly brown, but the consistency is exactly what I’m used to. Perhaps I’ll use white sugar next time. Thank you so much for the beautiful feedback, Amy! I’m so happy you liked them and that they got you on to the aquafaba possibilities. You could give them a go with maple sugar as well, as an alternative by the way, for a lighter color. But white sugar makes beautiful aquafaba meringue. Wow they are amazing. I really admire your dedication. I tried coconut sugar before but it wasn’t ground fine so maybe that’s why it didn’t work out. And I used lemon juice because I couldn’t find cream of tartar. I would of thought with that quantity of sugar the meringues would turn out darker. Great that it isn’t the case. Thanks so much, Dawn. Yes, I was initially worried about the color too, but surprisingly they turn out pretty light. I never cease to be amazed at the things you come up with! You did mention above that other bean liquids could be used. Do the end products (like meringue, butter, etc.) taste like the bean? Hi Jam. No the products usually don’t end up tasting like beans for me, though I have heard some people point out some varieties of beans will give things a different taste. But there’s absolutely no chickpea taste in the meringues. The reason I recommended sticking with chickpea water is because sometimes I find the bean water can have trace residue in it (can be murkier), and can impact the texture (weigh the mixture down) and look of the recipe. Since meringue is so fragile, I just suggested sticking with chickpea just because it’s safer in that sense. But for other less sensitive things, like say making a “butter” with it, or bake some cookies, other bean water can work well. 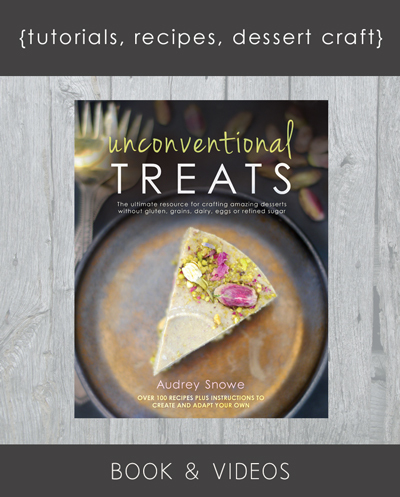 I have a question about aquafaba meringues…. I’ve tried to make them THREE times and they’ve all melted in the oven. My recipe usually is just aquafaba, cream of tartar, and sugar. What am I missing? HELP!! Could you recommend a substitute for guar gum? It’s hard on my stomach. Would finely ground psyllium, chia, or flax work? Hi Emily. You can try cream of tartar instead. I find it works slightly better with guar gum, but cream of tartar is the next best alternative. 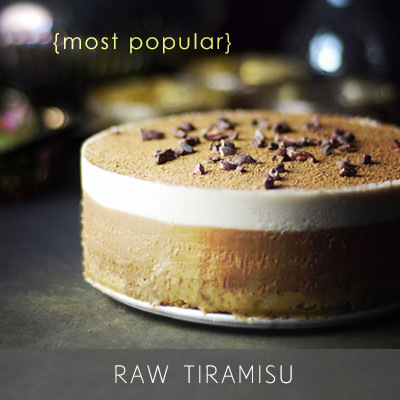 Chia, psyllium, or flax won’t work well here though, as they weigh down the recipe too much and distabilize it as a result (as opposed to guar and cream of tartar adding stability). Wow! I knew aquafaba could be used instead of egg whites in a meringue, but I never knew it could be used as whipped cream or mayonnaise! One question: I looooove “magic cakes” – the ones that separate into 3 layers when baked – but these use egg yolks for the bottom two layers, as they are heavy and sink, and whipped egg whites for the top “genoise sponge” layer. I really want to try and name a vegan magic cake, so do you think aquafaba would work instead of whipped egg whites, separating itself from the rest of the batter, when baked? P.S. aquafaba butter is another one I’ve seen around that sounds pretty neat (like this recipe, for example: http://plantepusherne.dk/vegan-aquafaba-butter/). Thank you sooo much Audrey! 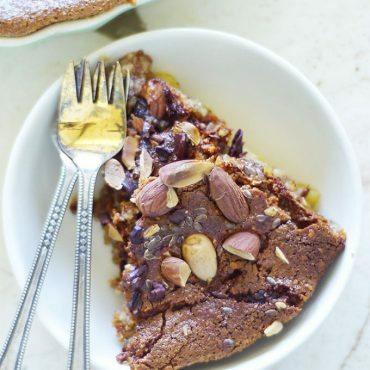 I’m so excited to get experimenting with this vegan magic cake – thanks so much for your help! ? Have you tried using maple sugar? I bet it would work. I definitely think it would. I love maple sugar as a dry baking sweetener. The only thing is that it’s a much more uncommon ingredient, so I tend to try and keep things more accessible for the blog. Also maple sugar is usually coarser (at least the varieties I’ve been coming across), so it would need to be ground down for meringue. But I think to be honest it would probably give the best results (better than coconut sugar) — just a question of sourcing it, as it’s not as popular as coconut sugar on the market yet, so not as widely distributed. P.S. The 2-day expiry is definitely not a problem over here, especially when nice cream gets involved (I actually have a recipe to share on that note soon… ? ).